An Australian study investigating five popular types of coffee brewing methods has found that espresso contains the highest concentration of caffeine. 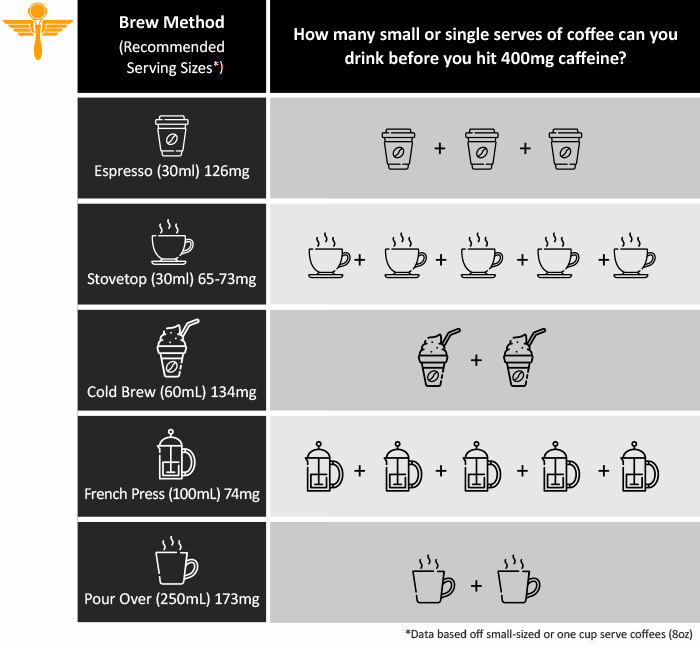 A White Paper report conducted by Crema Coffee Garage and the University of Newcastle measured the caffeine content of the espresso, stovetop espresso, pour over (filter brew), cold brew and French press (plunger) to provide consumers with accurate information about their caffeine consumption. With a lack of existing information about caffeine content in espresso coffee and alternative brew methods, Project Manager of the study at Crema Coffee Garage, Ravelle King, said they carried out their own analysis to fill in knowledge gaps within the industry. “While caffeine analysis of espresso has been explored, we found there was little information that showcased caffeine content in other methods and even fewer resources contextualised that data for the Australian market and consumers,” Ms King said. The strongest brew after the espresso method, which extracted 4,200 milligrams of caffeine per litre, was the cold brew at 2,240 milligrams per litre, the stovetop at 2,192 milligrams per litre, French press at 742 milligrams per litre and then the pour over at 692 milligrams per litre. Using a Colombian single origin bean to minimise variability in the results, the caffeine analysis was led by University chemist, Dr Ian van Altena. “We compared the brew methods by analysing for caffeine content in each of the brew extracts using high-pressure liquid chromatography,” Dr van Altena said. Although espresso contains the most caffeine when compared millilitre to millilitre (ml) with other brew methods, Australians typically consume more than the recommended serving size of alternative methods. “There is no uniform serving size for all methods and each brew is served differently, which increases the amount of caffeine per serve. For example, the average person will serve the entire contents of a 3-cup stovetop in an 8 oz cup, which is double the caffeine content compared with an espresso in the same size cup,” Ms King said. Ms King said that it was important to contextualise caffeine content according to how different markets consume their coffee. “We intend to provide all the data from this project to the Australian market, so that consumers can better understand coffee and their caffeine consumption and make more informed decisions about their intake,” Ms King said.